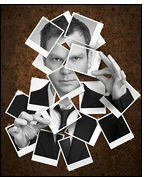 Gregory Wilson Lectures - three dates: Tuesday 31st August: South Staffordshire Society of Magicians (3SM). New never-before seen material! Limited space available - book now to avoid disappointment! South Staffordshire Society of Magicians (3SM), The Longford House, Watling Street, Cannock, Staffordshie WS12 1SJ. www.3sm.org.uk Contact: President Ian McGarva 07738 913293 7.30pm, lecture starts 8pm (Non-members welcome £10). Wednesday September 1st: 7pm - 9pm at the House of Magic, 80 Brook Street, Stourbridge, West Midlands DY8 3XB www.thehouseofmagic.co.uk. Phone 01384 373209 for details. Mac King, The Amazing Jonathon and Johnny Thompson - The Innovention, Las Vegas. From Paul Stone: The Innovention which is taking place at the excellent Suncoast Hotel & Casino in Summerlin, Las Vegas and is now only just over 6 weeks away, really has a stellar line-up of talent! Quite apart from two of Magic's Superstars Teller and Criss Angel, who rarely, if ever, appear at any Magic Convention, The Innovention also has a terrific line-up of several of the top Stars in Magic. Johnny Thompson, as well as being a magical treasure, is arguably the best all round magician in the world. Johnny is a great Stage performer, a terrific Close-up worker, a successful Tradeshow worker and is probably the world's most sought after Magic Consultant and has played a major role for Lance Burton, Criss Angel and more recently Penn & Teller. Johnny will be presenting the 'Johnny Thompson Hour' which promises to be a fantastic session. Johnny will also be appearing with Pam in their multi- Award Winning Act, The Great Tomsoni & Company, which is a true classic. Gaetan Bloom is another world Star who is flying in from France specially to appear at The Innovention. Gaetan will be presenting his fantastic Lecture and will also perform his Stage Act, direct from 'The Crazy Horse' in Paris. Another wonderful performer. Add to that Lennart Green, Joanie Spina, Richard McDougall, Joseph Gabriel (photo), Shep Hyken, Seth Kramer, Bob Kohler, Magic Al and many more surprises, and you'll realise just what an outstanding Convention this will be. The Famous Five go adventuring! Within 3 miles of Faringdon in Oxfordshire is Faringdon Folly – the last folly to be built in England. It was built in 1935 by Lord Berners, the then owner of Faringdon House and is a perpendicular building in the classic style, topped with gothic flourishes and mock battlements. 152 steps lead you to the top where there is the most wonderful view of five counties: Oxfordshire, Gloucestershire, Wiltshire, Buckinghamshire and Berkshire. Scanning the horizon you can see the Cotswold Hills, Didcot Power Station, the Uffington White Horse, the Iron Age Barbury Castle and even the huge Honda factory in Swindon. Plus 1001 other well known local sights. Sideshow Illusions at Margate and Sheffield. You can view Jon Marshall’s restored, original Sideshow Illusions, back by popular demand this weekend at Margate’s Dippers and Dunkers Festival, Saturday 21st & Sunday 22nd August, 11am to 6pm at The Market Place, Margate, Kent. Next week, Sunday and Monday, 29th and 30th August they are being presented at Sheffield Fayre, Norfolk Heritage Park, Sheffield. Admission is free. This year the shows will include the newly restored Monster Show which features a new version of Robert Harbin’s Invisible Man or Out of this World. The other attractions include Yvette, the Headless Lady - can medical science keep her alive? Visitors can also marvel at Cleo, The Girl in the Goldfish Bowl, a living, tiny, five inch girl and wonder at the statically charged Electra – she’s electrifying! Many of the shows were debuted at Margate’s Dreamland between 1961 and 1965, they were first exhibited by showman Jon Gresham and they have been restored to full working order by Jon Marshall of Sideshow Illusions working with Pat Gresham, Jon Gresham’s widow expert restored Dave Whatt and a multi-talented team. This unique collection of original shows, the only working shows from the 50s and 60s in the UK, returns to Margate, from Showzam at Blackpool where Jon Marshall worked with the Professor Vanessa Toulmin of the National Fairground Archive of Sheffield University, to enthral thousands of visitors earlier this year. “This will be a glorious celebration of the Sideshow”, said Jon, “There are so many people who have never seen one, it will be a pleasure to re-introduce them to a new generation. For those older visitors, I know it will evoke many happy memories of a different era and of course they are great fun”.